(15sep06) This issue will continue the panel stiffness essays. The 1 October issue will continue the topic. Don Burton takes his Mayfly out for a splash in Illinois. Nice polytarp sail. ...that the amount of stretch was proportional to the applied load, that is until we exceeded the material's "yield strength". But we agreed that it wasn't wise to exceed the yield strength in any normal load since it would result in a permanent stretch or complete failure of the bar. As long as we stayed below the yield strength we could apply the load almost an infinite number of times with no detrimental affect. Premium wood can handle that but a cheap 2.4 may not and our man gets nervous about that and adds a second 2x4 beside the first, result in a 2x8. The stress is reduced in half since the area of the reactive triangles has been doubled in width. Since strain and deflection of the fibers is proportional to stress, then the strain here will also be half and thus the overall curvature or deflection is half. Now the man does something interesting. Instead of laying the boards beside each other he lays one on top of the other, in effect making a 4x4 that is not joined in the middle. Now what happens? The answer is that if the two boards are free to slide over one another that the stresses are the same as for the 2x8 because the two boards are still acting independantly. In particular they are still bending to the same curve as the 2x8 and thus the same stress. But we also know now that here the 4x4 outer fiber strains are actually one fourth those of the 2x4 strains. So the only way that will work is if the curvature of the 4x4 is one eighth the curvature of the 2x4 with the same loading situation. So the 4x4 deflects one eighth as much under the man's weight as the 2x4. ... if you make a bending element deeper by a factor of X, then the strength will increase by X squared and the stiffness in bending in increase by X cubed. ...A fellow is sailing his dinghy in rough water as is getting nervous watching the 1/4" bottom flex a half inch with each wave. 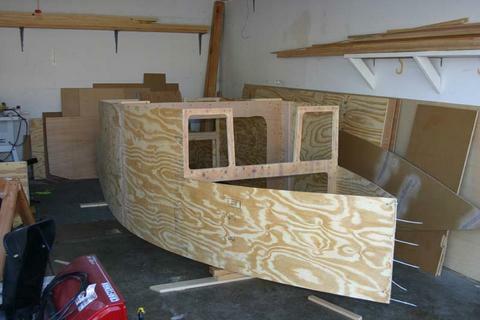 He goes home and epoxies a layer of 1/8" ply to the bottom to bring it to 3/8" total. Now how much does the bottom flex? Answer, he has increased the thickness by a factor of 1.5, so the bottom is now stiffer by a factor of 1.5 times 1.5 times 1.5 which is 3.375 and now his bottom is flexing about 1/8" with each wave and he feels better about that. When you make a panel thicker you gain thickness and strength very quickly. On the other hand if you make a panel thinner you lose strength and stiffness very quickly. NEXT TIME...we pick this topic up again to look at ways of stiffening panels. 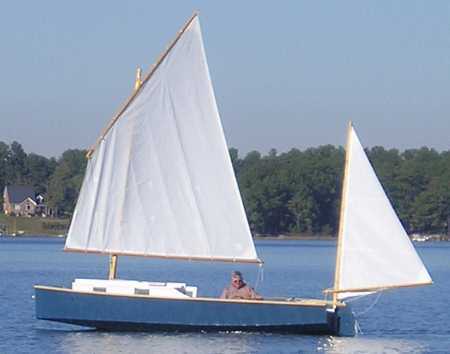 Mayfly14 is a straight forward flat bottomed plywood skiff for sailing and rowing. She's easy to build because her planks have no twists. That means that the chine log and wale bevels are constant for all practical purposes and can be presawn before assembly. 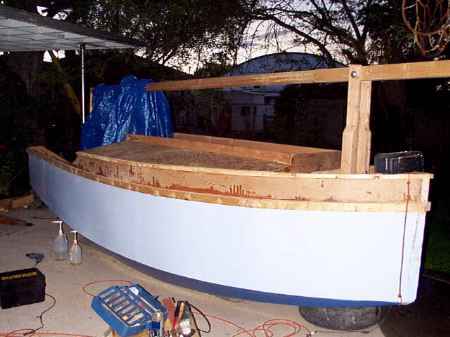 The construction is of the simplest nail and glue variety with no building jigs or lofting required - an "instant" boat. 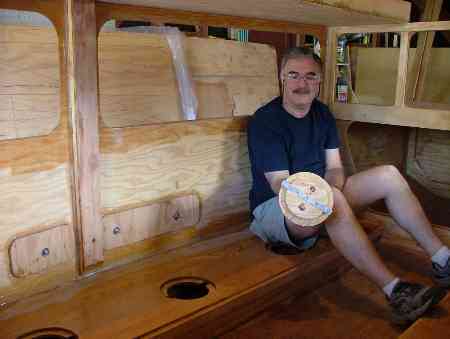 The prototype was built by Garth Battista and kids in Halcottsville, NY. I think this boat is about the right size for a lot of folks, although I might argue that it is too heavy to cartop with comfort and once you decide to trailer a boat you might as well go to a sixteen footer. Mayfly14 will take two adults easily and yet still be a wonderful solo boat. 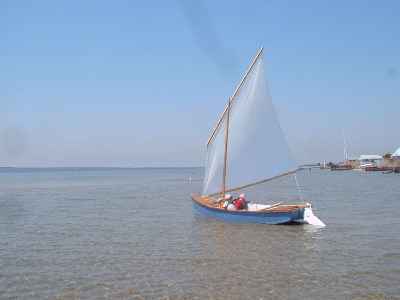 The sail rig is a balanced lug which is easy to build and stow. 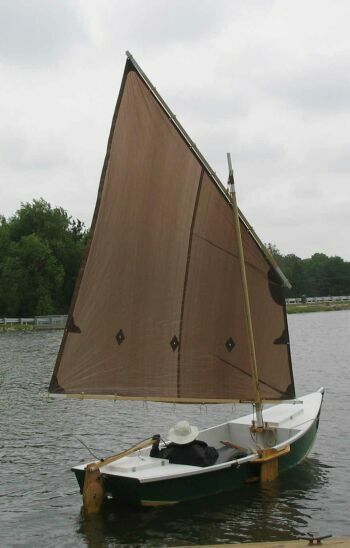 I recommend that my customers sew their own sails either from common polytarp (as Garth did in the boat shown above) or real Dacron sailcloth. The plans show instructions for sewing in real sailcloth. You need a sewing machine that sews zigzag stitches and cheap home machines are usually good at that. 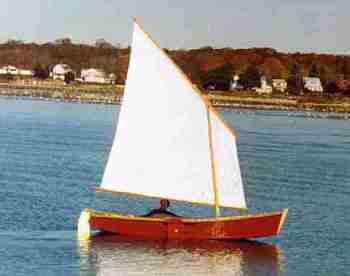 I don't claim to be the world's best sailmaker but it is not majic. I can do it and so can you. The clothes you are wearing are ten times more complex than a small sail. 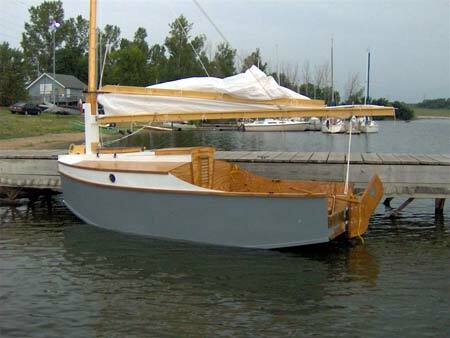 There are a few rules to follow and I give an essay on that with each set of sailboat plans. In fact I suggest you sew your sails before you build your hull. 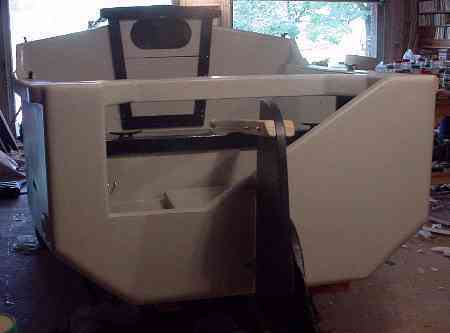 Both sail and hull require about the same work space. Sew the sail first, roll it up, stuff it in a closet, and now your workspace is ready for your hull. Getting the sail done can get you over a big mental hurdle. I think there are more but I lost the photos in a hard drive crash last winter. 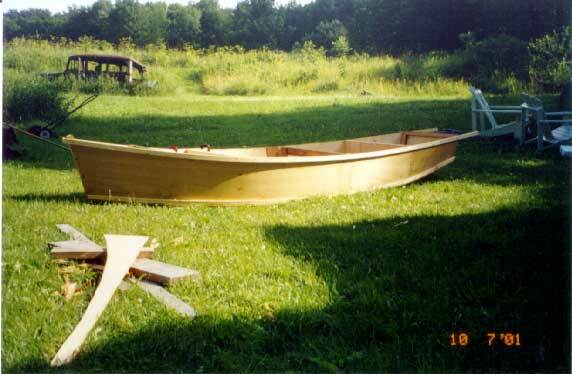 Mayfly14 needs three sheets of 1/4" plywood and two sheets of 1/2" plywood. Mayfly14 plans are $30. But, the Mayfly14 plans are shown complete in reduced size in my book available from Duckworksmagazine.com along with Garth's blow-by-blow assembly photos plus a huge amount of other stuff. The down South Picara is more or less complete now. Lots of slick detail as you see.